NRL Speedster On His Way To Hull? 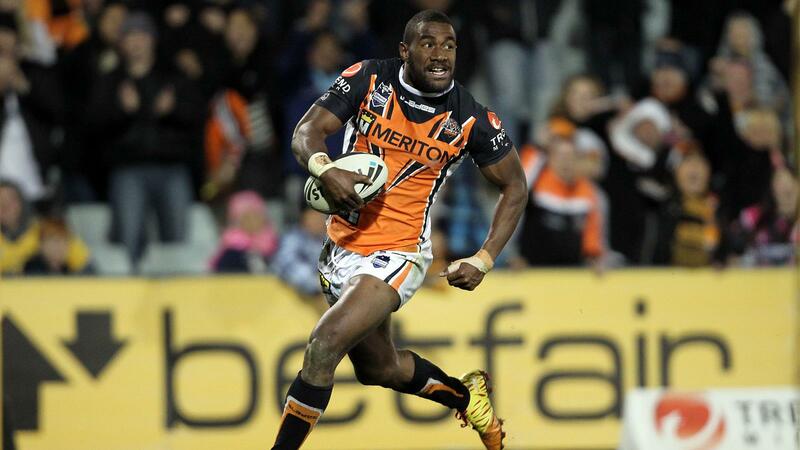 Hull FC are being strongly linked with a move for Wests Tigers’ Fijian wing-man Marika Koroibete. The 21-year-old has scored 12 tries in 15 appearances in the NRL after bursting onto the scene in explosive fashion in 2012, including a record-breaking four-try salvo against Paramatta Eels. Injuries curtailed Koroibete’s development in 2013, but he still managed to star for the Fiji Bati in the 2013 Rugby League World Cup – including a performance at the KC Stadium against England. He was tipped as one-to-watch for the NRL in 2014, but his campaign did not get off to the best of starts when he turned up to pre-season training late for the Tigers and he appeared to fall down the pecking order when David Nofoaluma was handed a three-year extension at Campbelltown. Many had expected Koroibete to be given a mid-season release, with Canberra Raiders or Cronulla Sharks touted as his likely destination, but Wests lost Taqele Naiyaravoro to rugby union in early May and the Fijian is likely to be retained as cover for Pat Richards, Tim Simona and Nofoaluma. With Koroibete out of contract at the end of the season there are sure to be plenty of offers on the table for the talented youngster, however the Airlie Birds look to have offered the winger a route out of the NRL. Lee Radford has been on the lookout for a new wingman since the Tom Biggs deal was cancelled, and with Fetuli Talanoa unlikely to be offered a deal beyond 2014 and Jason Crookes’ career with the Black and Whites all but over, Koroibete could be an option. With Hull expressing a desire to go for quality over quantity for 2015, a player of Koroibete’s undoubted ability might just fit the bill. Crooks Out – Tahu In? RFL Reveal New Structure For 2015 – How will it affect Hull FC?